Google News Timeline is the second new services released today in Google Labs. According to Google, it's "a web application that organizes information chronologically. Google News Timeline allows users to view news, scanned newspapers and magazines, blog posts, sports scores, and more on a zoomable, graphical timeline." 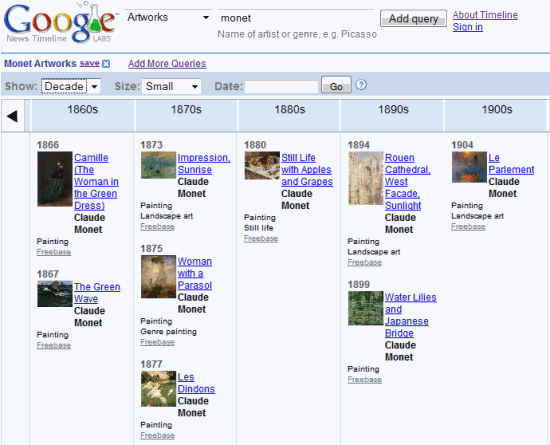 The search box is very powerful, but you first need to pick a category from the drop-down. Google lets you add different sources: blogs, newspapers and it shows structured information from Wikipedia and Freebase. You can create interesting timelines using this services and it would be nice to save them or to have a permalink for future reference. Hopefully, the service will also add the option to use custom data sources. p.s. aren't you creating a real operating system??? I really want to try it! I am unable to add The New York Times to the newspapers, it doesn't find it! Not working too well for me either. I selected 'blogs' and typed 'google operating system' and it shows 'No blogs available'. I couldn't get basketball scores to work, but it works for baseball - whats up with that? And it sometimes defaults back to the earliest dates available and the only way to get current info is to type in a date or scroll a lot. I think they need a dynamic date scroll bar like that on the Google Finance chart. It also needs a 'Today' or 'Current' button as well as 'Clear/Reset' button. 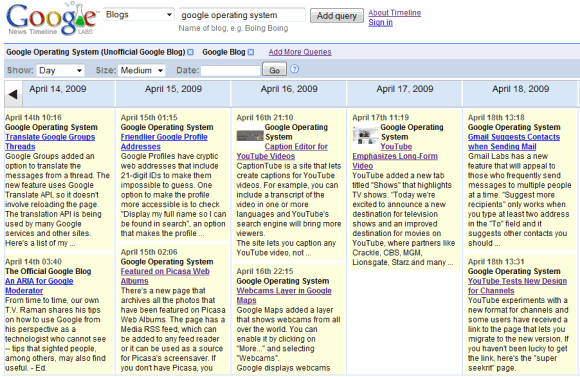 Click on "add more queries" and enter "google operating system" in the Blogs section. Google shows the top 10 results and you are supposed to click on the top result. When I wrote the post, I was able to add the blog directly from the search box, but now it doesn't work. I just noticed in the help section that sports scores are limited to baseball only, although the section is entitled 'sports scores', not 'baseball scores'. So, I'll assume other sports scores will be coming soon. Well, the 'google operating system' blog is now showing up for me anyway. Although it's a nice feature! Quite a great found samuel , its worth checking out really! Its really great. I don't know about this till date. Thanks. Google you are great for your timely launched features that are good for google users as me. Thanks for this new gift. This sounds cool! So are you saying that when we search for information, we have the ability to get it in the order from which they were created? Not too sure I understand! Google offers sooo many useful things. Much better than Yahoo IMO.